We all have our basic go-to beauty “must-haves” such as shampoo, conditioner, dry shampoo, foundation, bronzer, etc. We know we need them and don’t go anywhere without them. However, what if there were other products that worked wonders that you didn’t know about? I have news to share, there are! My friends will ask how my hair stays in place all day and how I don’t seem to have any dark circles under my eyes. Ladies, it’s not genetics. 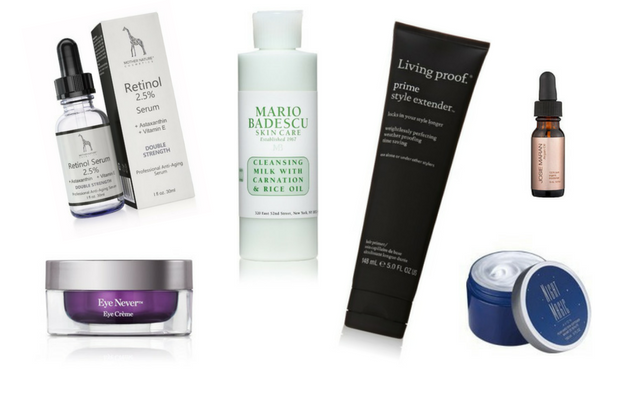 Here are the beauty products you never knew you needed…but you do! This is somewhat similar to a leave-in conditioner in that it is meant to be sprayed on clean hair and left in. It is similar to how paint primer helps paint go on flawlessly and stay on. It is, designed to make all of your other hair products work even better. Plus, who doesn’t love just one more lovely smelling hair product to use in the morning? Try Living Proof Prime Style Extender Hair Primer. Skin softener is a lightweight liquid with a toner-like consistency. While it looks like a toner, a softener is part of the moisturizing phase. It is lightweight and feels unbelievable as it glides across your skin. Try Avon’s Night Magic Evening Musk Perfumed Skin Softener. Cleansing milk is just what it sounds like. It is a creamy, lovely cleanser that moisturizes as it cleanses and adds suppleness and a glow to your skin. If you know a little about the history of skincare then you know that milk has been used as a cleansing moisturizer practically forever. Queens and princesses once soaked in baths of milk. There’s a reason that milky, smooth lather makes you feel like royalty. Try Mario Badescu’s Cleansing Milk with Carnation & Rice Oil. You thought that the day would never come. You remember your mother and grandmother with their night creams, don’t you? Well, turns out, they’re still amazing and the products have become even more advanced. So to avoid those pesky circles and lines that don’t go away, you need one. Stat. Try vbeauté’s Eye Never Nourishing DNA Repair Eye Crème. It’s well worth the investment. This chemical has been used in facial lotions, creams and treatments for years. Though it sounds a bit scary, it isn’t. It simply helps to reveal your lower layers of amazing skin. It makes you, literally, glow. You do need to be careful in the sun with it on, however. So, as always, be sure to follow the instructions carefully and be all lathered up in sunblock before you head outside after using it. Try Mother Nature’s Retinol Serum. When you are young, all that you want is to keep oil as far from your face as possible. But as you age, your skin needs a bit more of a moisture boost and facial oils give you just that. Just rub in a few dots over top of your night cream. Try Josie Maran’s Argan Oil. There you have it! These beauty products will help to keep your skin looking moisturized and lively, and your hair in place. Then, when your friends ask how you look so put together, you can share the secret about beauty products that your friends never thought they needed!